Rockstar Husqvarna’s Pablo Quintanilla has delivered the goods on day three of the Dakar Rally, securing a close runner-up result on the day’s timed special stage, the Chilean is now the rally’s provisional overall leader with three out of 10 stages contested in Peru. Featuring a mixture of dune riding and some mountain passes, stage three of this year’s Dakar was highly positive for the Rockstar Energy Husqvarna Factory Racing team. Putting his experience to good use, Quintanilla enjoyed a mistake free stage to cross the line with the second fastest time of the day. 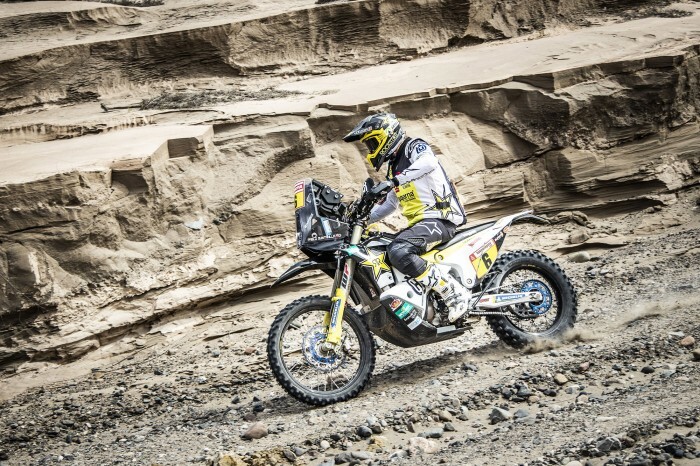 In a total time of more than four hours, Quintanilla was just 15 seconds slower than stage winner Xavier de Soultrait and now holds an 11-minute lead at the top of the rally’s overall standings. “The real Dakar has just started and I’m happy with where I’m at right now. Today we had a difficult stage. There was a lot of fog and in some parts you couldn’t see far ahead. If you tried to push, you ended up missing the right tracks,” said Quintanilla.